Spa lovers, in need of some R&R but fancy trying something new? From 24-karat gold facials to slimming chocolate body wraps, it’s time to shake up your spa experience with these truly unique treatments. 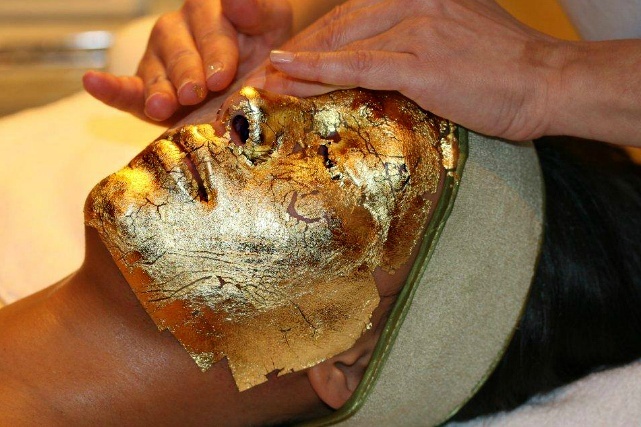 Yes, you read that right – a 24 karat gold facial really does exist! This luxurious treatment uses the natural healing properties of gold to deliver that sought-after Hollywood radiance. Enriching the skin, this facial includes a mask made of 24K gold and a 24K gold serum massage for deep relaxation. Available at Biolite Aesthetic Clinic, it’s a favourite among Dubai’s VIPs and perfect for those looking to shine at their special event. Calling all chocolate lovers: Dubai has a chocolate body wrap that’ll help you slim down too! Hello best of both worlds… The treatment at YHI Spa begins with an exfoliating Peruvian chocolate body scrub, followed by a layer of melted chocolate. Cling film is then wrapped around the body with a heated blanket for 30 minutes, ending with a full-body massage using chocolate syrup. Yum! Time to go coco-crazy as SensAsia has a massage that’ll make you crave coconuts for life. The spa’s 60-minute ‘Coco-Nutz’ massage is a full-body treatment that targets tired muscles using pure virgin coconut oil. If that’s not enough, you can pay a little extra and treat yourself to the ‘I Am Coco-Nut’ – a 90-minute treatment that involves a coconut-based body scrub before the Coco-Nutz massage. Wake up and smell the coffee with Talise Ottoman Spa‘s incredible Coffee Peeling hammam treatment. This experience uses Turkish coffee to refine and tone the skin, followed by a full-body coffee peeling which not only leaves your skin feeling rejuvenated, but your mind too! From the best facials in Dubai to must-try hammam treatments, check out our ‘Look Good’ category for all your pampering needs!